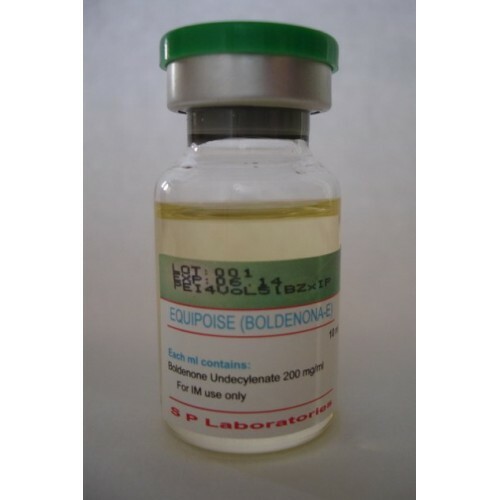 Equipoise (Boldenone Undeclynate), or "EQ" is one of the most widely used compounds by athletes today. It can effect slow and continuous muscle mass and strength gains over a prolonged period, and generally cycles with this drug tend to be quite long because of this fact. Men get good results from a 300-600mg weekly total. In the past, this included utilizing an every other day (EOD) injection schedule, because Eq was only available in very low concentrations (50-100mgs/ml). Women have made excellent progress with dosages of 50-100mg total weekly doses, and this usually means a 1 injections weekly schedule. Women as a rule, seem to prefer less scar-tissue build up than men are comfortable with. In this dose range, women almost never report virilizing side effects, and usually only experienced an elevated libido. Increased hair growth on face and legs is, of course, possible (though not probable)..
Liver toxicity is not an issue with Boldenone, and it can be used for long times on either a bulking or cutting cycle, very safely. It has a reputation for appetite and red blood cell production stimulating effects, and this makes it very nice for a bulking cycle. Obviously with increased red blood cell count an increase in oxygen transport was also realized, as was improved nutrient transport, making less food become more efficient...a very nice effect for a cutting cycle. Athletes generally stacked Boldenone with testosterone and Anadrol for mass cycles. Dianabol, due to it's close resemblance to Eq chemically, is not usually used interchangably with Anadrol in cycles containing EQ (a rare exception). Cutting, or pre-contest cycles including Boldenone often include Trenbolones, Winstrol. With the afforementioned drugs, an anti-estrogen is generally not necessary.